Last year South African sprinter Oscar Pistorius blew people's minds when he came in second in a 400-meter footrace in Rome...without feet. 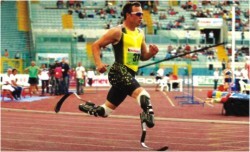 Pistorius is missing the lower part of both his legs, and ran on two carbon-fiber "Cheetah" leg prostheses. A lawsuit followed (of course), and Pistorius was banned from international racing. But Pistorius appealed, enlisting the help of human augmentation guru Hugh Herr of MIT to dissect the argument that his Cheetah's gave him an unfair advantage in the race. Last week the Court of Arbitration for Sport upheld the appeal giving Pistorius the right to compete in this summer's Olympics in Beijing. It's a landmark decision, and as Herr says below it's the first step toward recognizing that technology is allowing people with disabilities to become world-class athletes. Herr's argument is a bit technical but fascinating and worth a read through in this interview if you've got the time. So, what are the broader implications of the CAS ruling? Oscar will be given the opportunity to qualify for IAAF-sanctioned events. But broadly, it will be progress in the overall initiative to fully integrate people with disabilities in society. Some people in the world witness an extraordinary athlete that has artificial legs or arms . . . and they immediately think that cannot be so--disabled people cannot be this good at something. It never occurs to some people that Oscar may be a remarkable athlete. They think he has to be cheating. Mark Twain had it right when he said the sentence quoted above. Clothes make the man to an extent where it's more natural to agree with the epithet of the title. A simple piece of accessory goes a long way in saying something about the wearer. This does not go to say that the price tag of the clothing item makes the man; the cloth itself makes the man. A separation between nice clothes, and expensive clothes is necessary. The common assumption of better clothes meaning an increase in the price level is a widely held view. Clothes make a man on levels of what it makes him feel like, and what it says about him. For example, a wealthy aristocrat used only to Parisian haute couture would most definitely feel embarrassed and uncouth in regular gap jeans and T-shirt. It would affect him psychologically, hindering his confidence, and in effect, his productivity and efficiency at work, as well as social circles. A layman used only to working jeans would feel clumsy and ungainly in the aristocrat's haute couture. The usual price tag of $10,000 to $40,000 itself will be a huge intimidation working on his psychology. On top of that, he will be used to what he's usually comfortable in; the complexities of fine clothing will make him feel more inept and thus less confident. This will affect him at work and society; wherever he goes. Clothes have a huge influence upon a person's life. What he wears directly affects his ability to work and socialize. Everyone has been in a situation of dilemma where he or she has been unable to think of what to wear for an important occasion. This shows the grip clothes have on the human psyche. Our modern world has been shaped by past history. And throughout history clothes have acted as a symbol of status, and even today, we cannot escape that. Do clothes really help in getting someone to help one at a Department store? Or to receiving better seats at a restaurant? To a very large extent, it does. It can even be scientifically backed that what one wears does make a difference in how one influences the world around them. The very credibility of a person sometimes depends on clothes. In situations such as job interviews, court testimony, presentations or dates, it is very important to make a good first impression. As Will Rogers has said, "You never get a second chance to make a first impression". Leaving the psyche of the 'wearer', it is important to note the psyche of the 'viewer'. Behavioral scientists will be able to propound on how the process of sizing someone up by the clothes they wear is on the most subconscious and emotional level of the brain. According to them, the evaluation by a stranger of a person takes only thirty seconds, and this first impression can take almost five years to erase. Therefore it is much simpler, and also safer, to build the first impression well with one's appearance, which includes what he wears, and then gradually moving on to showing one's real merits and values. Which doesn't go to say that dressing well in itself is not a merit. There are very definitive images in all of our minds. If someone were to mention a cashier at a fast-food joint, the first image would be of this person, most likely in uniform and jeans and hat. This image comes to us on a subconscious level. The exact same thing happens when one mentions a high level executive. There is an image of a sharply attired man, most probably in a dark blue suit. This is a very definite image of credibility, authority, and power. If one still believes in the saying 'Don't judge a book by its cover' they do not belong in this day and age. The very cover of a book decides whether a casual reader picks it up or not. A book that is not picked up is a book that does not sell. A well-dressed and confident man will be able to sell himself. A poorly dressed man will create a terrible impression, and even putting that fact aside, if he's not comfortable in what he wears, he will be far too uncertain to show his real worth properly. The great French renaissance thinker Montaigne has said “We praise a horse for its strength and speed, not on account of its harness; a greyhound for its swiftness and not its collar; a hawk for its wing and not for its jesses and bells. Why then do we not value a man for what is his?” But there is a side to this that even Montaigne ignores. A horse does not choose its harness. Neither does a greyhound choose its collar. They have them imposed on them. A man however chooses what he's going to wear, and in doing so he chooses how he's going to appear to his peers. What this means is that there is some justification in judging a person by his external attributes; because he chose it, it says a lot about him. For the outward appearance that we choose on our own, unlike the outward appearance imposed on a horse or a greyhound, are very well rounded indicators of what is internal, what a person is really like, and how his ability to make choices is like. In the case of us human beings, the outward appearance is not merely an outward appearance.